Define your right mix with expertise that helps assess the unique needs of your apps, services and enterprise to achieve the optimal mix of traditional IT, private cloud and public cloud services. 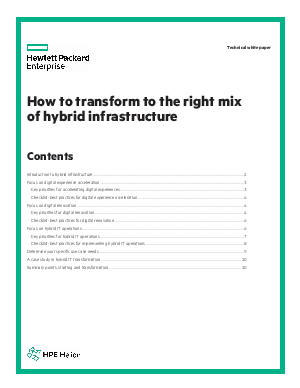 Power your right mix and evolve your IT infrastructure to be a flexible, cost optimized hybrid environment that can deliver your current and future digital services. Optimize your right mix by simplifying operations with automation and orchestration capabilities for managing and securing across your hybrid environment to provide continuous delivery.